A couple of years ago I slashed a few paintings with the intention of destroying them. In the process, I ended up saving little scraps of the most interesting passages. Sad to say, I haven’t been able to locate these since our move. But I’m very tempted to do this again. Some of these pieces were incorporated into new works, and some of them became the basis for artist trading cards. I can even envision making a whole patchwork piece from a collection of these. I art, nothing is really wasted. Nia, I’m sad I’ve lost those pieces, but there are more canvases around that need to just go away to the scrap pile! Thanks, glad you like that idea! Patchwork! Can’t wait to see it. 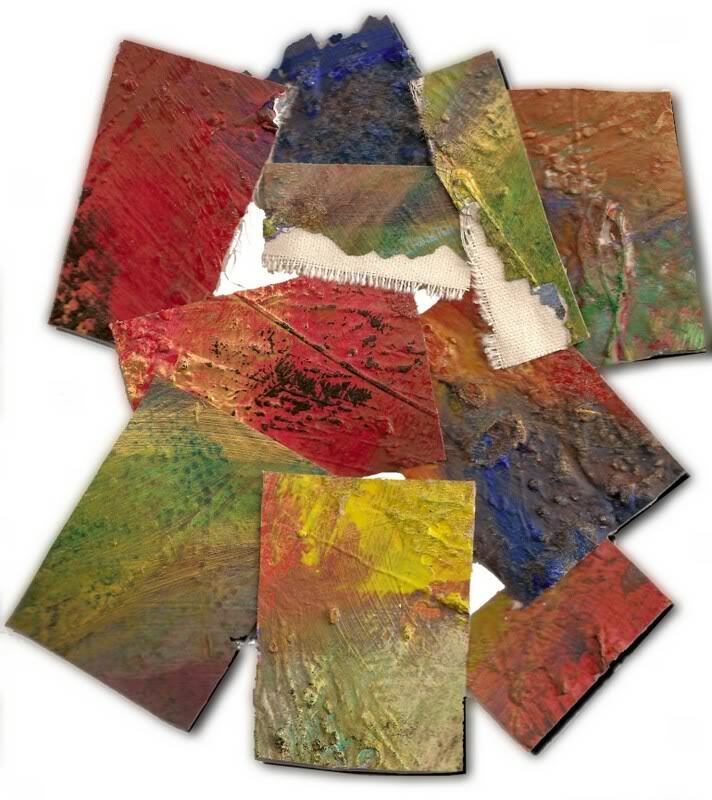 years ago i read ‘painting the spirit of nature’ by maxine masterfield – a great inspiration – and she suggested cutting paintings that don’t seem to work into strips and then weaving them together. so two paintings that dont work get combined into one. its fun to experiment with the idea… and maybe could be done with strips of canvas and other materials as well. i like the brightness of the panels in the previous posts martha… so cheerful on this grey day in the salish sea. it is lovely to visit your blog again! Nancy, I have that book somewhere, and used to look through it all the time. I had the honor of meeting her about 10 years ago in Sarasota, Florida, in a little gallery where she was taking down her show and I was putting mine up. It was a fun little serendipity. I love the weaving idea. Had a book on woven paper at one time too. I say go for it, Lynne! It’s very liberating.